An introduction kit about Deaf people and Culture for the friends and family of Deaf individuals. Within Deaf Culture, people take pride in who they are. Being deaf is never looked as a handicap, or a limitation of any kind. In fact, being Deaf is just as part of their identity as much as being American may be a part of yours. Deaf people, like many other minority cultures, try their best to keep their language, history, and traditions alive through means of storytelling. Against all social pressures of achieving “normalcy” in the hearing world, Deaf people have remained resilient. 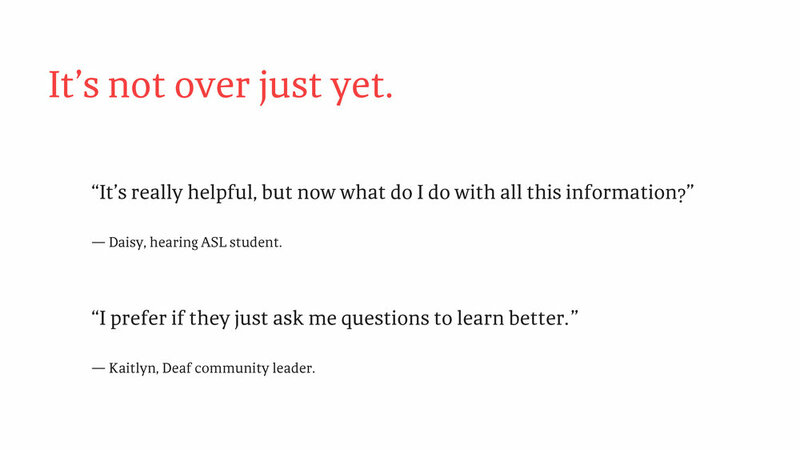 This kind of success has lead me to believe that Deaf Culture itself has no problem to solve for, but it is us, the hearing community that is in need of something. In particular, it is family members or the friends of Deaf individuals that have to most difficulty understanding the rich and unique qualities of Deaf Culture. Even though I started by learning from the Deaf Community, I focused on the friends and family of Deaf individuals specifically as the focus for my design work. Being an aunt to a Deaf person myself, and having interviewed other friends and family of Deaf Community members, most hearing people felt lost when first becoming interested in the community and culture. A way that would ease that confusion would be to create a kit that would provide information as well as facilitating stories between them and their Deaf loved-one. I also added a digital component to this idea to help them find locally-based groups willing to reach out and answer any questions they may have.